Two-piece Merkel seal set for sealing pistons, consisting of one PTFE profile ring and an O-ring as a pre-load component. 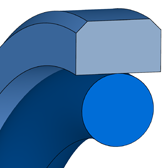 Merkel Omegat OMK-MR is used where a piston has pressure on both sides. 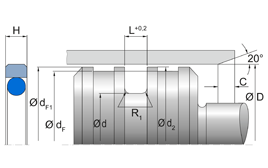 OMK-MR is provided with pressure-compensation grooves for rapid pressure change.